Home » College Students » Career Guides » Should You Get an MBA? A Masters in Business Administration, or MBA, is considered by many to be the catalyst to the start of a business career. Most people see significant salary increases after graduation-our data shows a 44% increase in salary after graduation, and total compensation increasing by 82%. MBA’s are a great career reset button. An engineer saw his salary jump from $65,000 to $317,500 after graduating, pivoting to a role in investment banking. But how to begin? What are the best schools? The process can be a bit daunting, so we took a look at the application process for MBA programs and found out the next steps for those considering graduate education. Graduate school may be a bit far off for undergraduate students, but it’s never too early to start thinking about! The average age of an incoming student in business school is 27. Applicants have gone out into the working world, and either want to take a break to go to business school or possibly take classes at night and continue to work. Many MBA students felt stuck in their current career path, and decided to go to to business school to jumpstart their career. Our data indicates that 90% of all full time MBA students changed either their pre-MBA industry or their job function. Along with the GMAT, many of the top schools accept the GRE test as well in order to diversify the candidate pool. The GRE is a more generic test for graduate schools, with less of an emphasis on business. Before taking the GRE make sure the schools you’re applying to accept it. Here’s a list of the top 10 business schools as they are currently ranked, followed by their average GMAT score and acceptance rates. 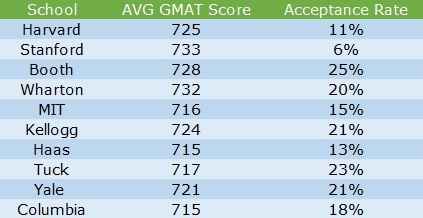 These average scores are all within the 90th percentile of all GMAT scores, and the average GMAT score is 551.94, out of 800 possible points. Awesome! You’ve taken the GMAT and have a great score, and you’re ready to start applying. What next? An important thing to keep in mind with MBA programs are the concentrations of the program, sort of like a major. There may be schools offering concentrations tailored to your specific programs, including very specific concentrations like museum leadership at the University of Delaware. Be sure to find a program that meets your specific interests and career goals. Obviously the most important thing about all of this is the ability to afford graduate school. Unfortunately, like most higher education, the top programs can be quite expensive. Stanford estimates a cost of $218,436 to complete the 2 year program, though this includes a very conservative living allowance of $33,294 a year. 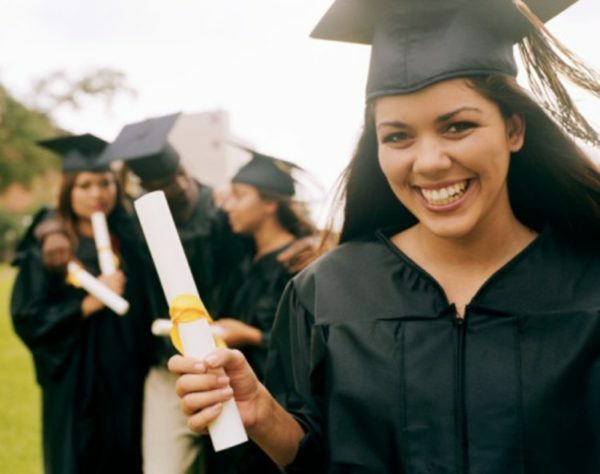 For the highly qualified (again, typically determined by high GMAT scores or stellar work record), scholarships are available – check out this site for MBA scholarships. Not all MBA programs are quite this expensive though. Bloomberg provides this chart that goes over how quickly you can expect a return on your MBA investment, with the University of Wisconsin-Madison offering the highest return of over 50% within the first year of postgraduate work. If you think an MBA might be a good option for you long-term, it’s important to keep in mind now what may affect future applications. Undergraduate GPA does matter, along with any work experience possible from internships or part time jobs. Keep your goals in mind, and good luck applying! Still not convinced an MBA is for you? Check out our analysis on whether you should apply to grad school right now or wait. Questions? Comments? Chat with us. Looking to enter the workforce for a few years before applying? Sign up for a free TransparentCareer account to quickly and easily find data relating to career paths, compensation, and career satisfaction.